I purchased 14 grape starts in April. Four of them concord, the rest, muscadine, jumbos and cowarts. The concords were planted in pots immediately. They were kept in the greenhouse most of the time. Unfortunately, I needed the greenhouse space for other things and the concords went on the front porch. They were hit badly by a frost a couple weeks ago. Right now, I think I only have 2 concords. We’ll see. I’ll keep watering the other two in hopes that they’ll come up later. 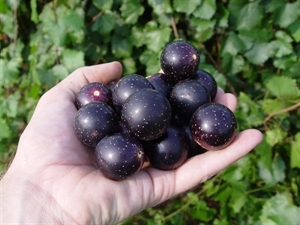 As for the muscadines, they arrived on the 13th of April. And I did nothing with them. Luckily for me, my lovely spouse watered them as they were. I potted them today. They’ll go up on the hill soon. Let me back up a bit, because I want to talk about the ordering process, bare root plants, etc. I searched the Internet for the best place to order muscadines. I don’t know if I succeeded, but I think Bottoms Nursery is great. I managed to order at the close of their season, but they let me make my order. They were very friendly and helpful. This is the way the starts arrived. I think I was at work then, so the girls opened the box to make sure everything was ok.
A box full of grass! Boy did I get ripped off! Actually, that’s packing. the grass was damp. The starts were wrapped in soggy newspaper. So the girls put the starts back in the box. And I did nothing. Fortunately for me, I have an amazing spouse. She kept watering the newspaper-clad starts. The starts are still in the box. I finally potted them today. All of the cowarts are looking good. All have buds or leaves. The jumbos don’t look as good, though all the vines are still pliable. Two of the jumbos have leaves and buds. We’ll see about the rest. There’s a lesson here. 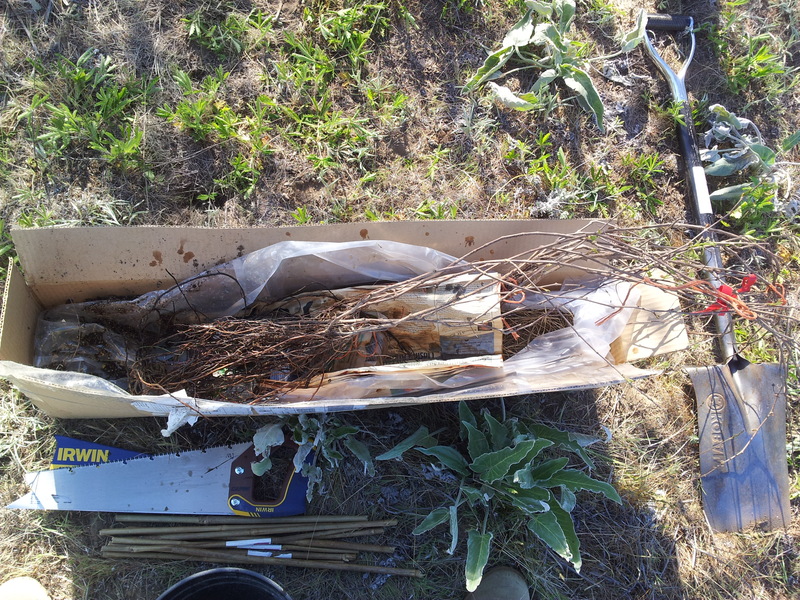 Bare root plant orders can be fine. I do think that there’s an advantage to having the soil with the root. You can get positive organisms that will help the plant. There’s the other side of the coin when the soil brings in something bad, zapping your garden. 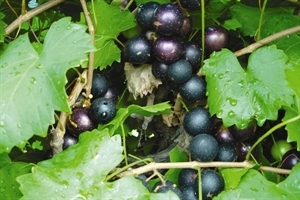 This entry was posted in Plants, Shrubs and Trees and tagged bare root, cocord, cowart, grapes, jumbo, muscadine by admin. Bookmark the permalink.